Most SUV (Sport Utility Vehicle) drivers choose their vehicle’s safety features carefully – considering ABS, airbags, and traction control. But more often than not, they underestimate the vital role that tires play. As the only contact with the road, good tires are a driver’s first guarantee of a safe and comfortable ride. The area of a tire that touches the road surface is approximately the size of a palm. It is not much when you consider all the functions of a tire: supporting the car, transmitting traction and braking forces, absorbing road shocks and steering. This is why tires should be regarded as a priority when considering the safety of any type of vehicle. The Michelin Primacy SUV tire is exclusively designed by Michelin for SUVs. It was developed specifically for the Asia Pacific’s extreme road and weather conditions with the objective of offering maximum safety to SUV owners and their families. Speaking about the new tire, Michelin Philippine Chief Representative Michael Nunag said, “We have listened to SUV drivers in our region. They choose their vehicles because they want more safety for themselves and their family on their daily commute, as well as during long distance travel. 2.2 meters shorter braking distance on wet roads. 6 percent improved grip in wet cornering. 1.9 meters shorter braking in dry conditions. This is achieved through the use of three Michelin tire technologies: FlexMax 2.0, StabiliGrip, CushionGuard, and EvenPeak. As a result of the combination of these technologies, the Michelin Primacy SUV tire is able to offer drivers a safer, smoother ride. And thanks to Michelin Total Performance, this is achieved without compromising other tire performance characteristics such as tread life and fuel consumption. 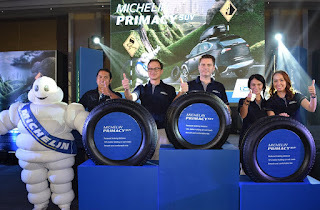 The new Michelin Primacy SUV tire is recommended for popular SUVs like the Toyota Fortuner, Honda CR-V, Nissan X-Trail, Isuzu mu-X, Audi Q7, Volvo XC90, and Mitsubishi Pajero, among others. The new tire is already available in all Michelin Authorized dealers nationwide. Where is this made? Warranty length?